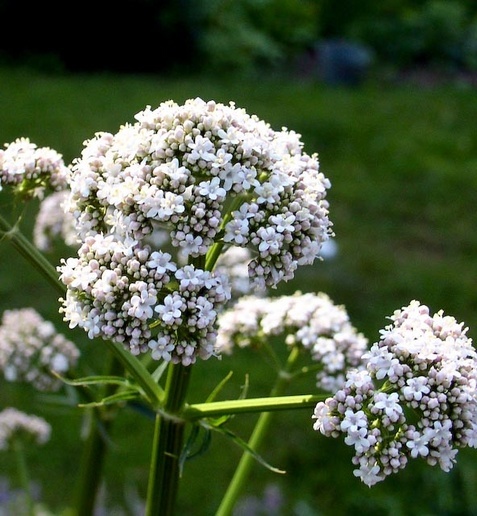 Valerian's medicinal uses are discuseed at length in a detailed fact sheet published by the US National Institute of Heath, last updated in 2008. Dried valerian roots are not very tasty, so grinding them up and mixing the powder with something easy to swallow, like applesauce (for people) or peanut butter (for dogs) is a great way to ingest your home grown valerian. Cats usually help themselves to the stringy roots, leaving a mangled mess when they are done. 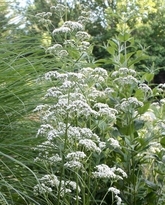 In the perennial bed, valerian's height and texture make it work well with tall ornamental grasses and butterfly bush. My new book, coming in May 2017! 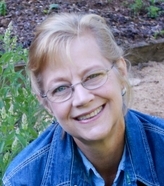 I smelled the grandma of all our valerian plants one Saturday morning in late May. With a sweet vanilla fragrance that's strongest late in the afternoon, valerian (Valeriana officinalis) makes me happy to keep weeding until dark, just to be in her company. Valerian is so richly fragrant that some old timers call it garden heliotrope. I love this stuff, and so do the cats. I often dig and dry several slightly stinky valerian roots to keep around as medicine -- outside, but out of the reach of cats and dogs. People take valerian to help with sleep, but for cats and dogs valerian is an enjoyable mind-altering drug. It turns out that valerian's calming effects travel Valium-like neural pathways in the brains of dogs, cats and people. Yet the vanilla-musk fragrance of valerian takes it far beyond being a medicine-cabinet herb. A few stems in a vase will perfume a room. Indoors or out, fragrant valerian is always a sweet surprise. In late spring, valerian (Valeriana officinalis) makes a statement with its lush spire of coarse foliage. 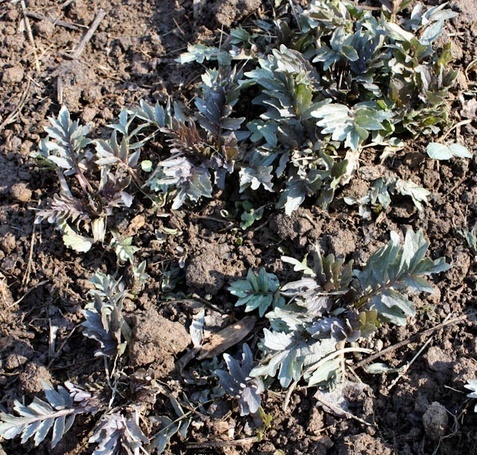 When established clumps of valerian emerge from dormancy in early spring, you can cut away crowns from the outside of the clump. Either pot them up to share with friends, or transplant them to where you want more fragrant valerian. Also see my Pinterest board that links to my herbie work around the web. Valerian's sweet perfume pumped from this spring garden bouquet for three days. 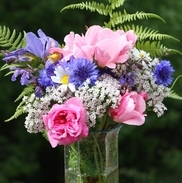 Also featured: blue bachelor buttons, siberian iris, garden sage, oxeye daisy, and two pink roses -- a modern Pink KnockOut and an antique of unknown origin. This paper in a Colorado State University veterinary journal gives a green light to using valerian for dogs with serious anxiety problems. The title of the paper is Valerian Root: Herbal Valium?). When growing valerian for dogs (or cats), dig the plants, rinse the roots well, and then dry them in a warm place out of the reach of animals. When stick-dry, store the dried valerian roots in a jar, kept in a cool dark place. Every week or so, get out a handful and chop them very fine. Put about a teaspoon full in a small amount of your dog's food daily. A tincture my give faster results, but making one is another story. Standardized tictures of valerian for dogs (and people) are widely at health food stores. Valerian can reseed too well and become weedy, but gathering the blossoms as cut flowers naturally limits reseeding. Volunteer seedlings that are allowed to grow until the following summer often have nice roots if you want to harvest an annual crop. 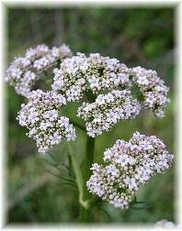 Dried valerian roots can be used to promote sleep or overall calmness in people or dogs.